The financial trouble behind the Lord of the Rings prequel has reportedly been resolved, meaning it's full steam ahead to the Lonely Mountain. It's been a rough and rocky road, but it looks like the pair of movies based on J.R.R. 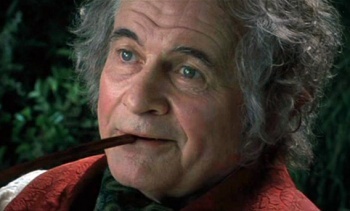 Tolkien's book The Hobbit, are finally moving forward. According to a joint announcement from New Line, Warner Bros., and MGM, filming will start in February next year with Peter Jackson filling the vacant director's post. Jackson replaces Guillermo Del Toro, who stepped down as director earlier in the year after the production started to interfere with other commitments. Besides needing to find a new director, funding has also been an obstacle for the project, as MGM's financial difficulties cast doubt over the studio's ability to pay its share of the estimated $500 million budget. But the BBC reports that Warner and MGM have been able to reach an agreement that will allow the movies to go ahead. Unfortunately, it's not all plain sailing just yet, as there is still an unresolved dispute with an Australian actors union, which may result in the studios abandoning New Zealand and filming the movies in Eastern Europe instead. The original plan was to make The Hobbit as a single movie, then create a second film that tied it into the Lord of the Rings trilogy. That plan was scrapped when the writing team, which included Del Toro and Jackson, realized that there was more to the book than would fit in just one film. Sir Ian McKellen, Andy Serkis and Hugo Weaving have all signed on to reprise their roles as Gandalf, Gollum and Elrond respectively. As long as no further delays occur, the two movies will film back to back using digital 3D cameras and have been pencilled in for release at some point in 2012.